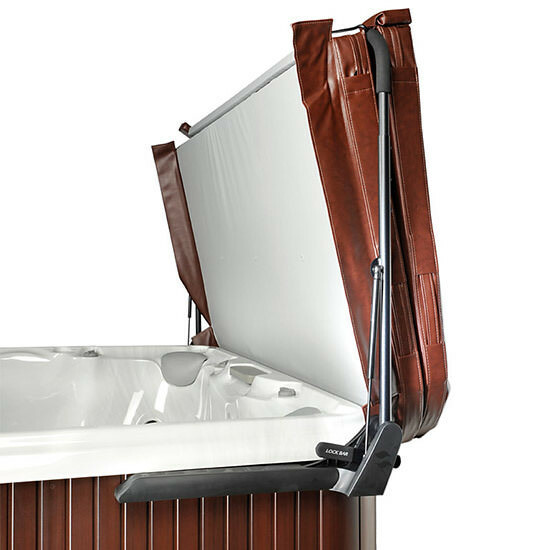 The CoverMate 3 hot tub cover lifter is one of the top hydraulic spa cover lifters on the market today! The hydraulic lifter offers beauty, reliability, and superior operation. The patented wind lock system is the unique feature that sets the lifter apart. The wind lock system is designed to eliminate broken shock syndrome which is a common occurrence for some hydraulic lifters. The CoverMate 3 is also built with an aluminum full-frame and composite mounting brackets. This is one of the best setups you could ask for in a hydraulic lifter because it is so easy to use. This lifter will leave you with no heavy lifting or dragging of your hot tub cover. You can move your hot tub cover with one hand. The perfect lifter when you have little clearance behind your hot tub and spa.